A friend recently shared an article with me about the ruble dropping (partly in response to sanctions) and asked me what I thought about it. Go read it first, it's quick. I'm not going to summarize. Read it yet? No, really, go do it. Alright, good. Below is a modification of my original response, which I just wanted to share with everyone. First, I think "2 guys got arrested" --> "Russia's economy is eating itself" is a grossly over-inflated and completely un-supported assertion here. Putin is on top because he does a great job specifically pitting his oligarchs against each other and reminding them that he can snap his fingers and crush them at any time... while keeping them rich. So the government still doing that is not surprising. The oligarchs aren't in charge of the justice system (Putin wouldn't trust that) so I don't see how the arrests relate at all to oligarchical bickering. The ruble dropping isn't great, but it does mean that you can buy more bread (domestically made) for each barrel of oil you sell, so Russia's gas/oil imports will be buffeted here against the drop in the general price of oil/gas. Dropping one's currency is also a way to pivot an economy towards internal manufacturing, which may also be a deliberate move by Putin's administration to become less foreign-dependent, and it may be a sign of an economic strategy rather than just a political one. So yes, Russia is "digging in," and no doubt, it's getting ready to survive long-haul sanctions. But that doesn't mean the Russian economy is going to collapse. Putin is a smart guy. If he's planning to lose trade with the West, the first thing one wants to do is create as much domestic manufacturing as possible, and the ruble dropping is step one to doing that (because imports get expensive, exports get profitable, so local manufacturing is stimulated). The pain of the ruble dropping will pass as entrepreneurs seize on the opportunity to build new industries that take advantage of new domestic cost advantages. Russia's got the metal to make a lot of what it imports, excepting the luxuries that wealthy Russians love so much (but we don't need to worry about them). They'll be fine. The only way to really choke off the Russians is to cut oil/gas imports dramatically, and the Europeans aren't ready to feel the sting of that, themselves. Why I Was So Damn Wrong About ISIS--Or Was I? So I was pretty optimistic about Iraq's ability to go get ISIS after they slowed down in their march towards Baghdad. ISIS has held onto much of the territory it gained back then, and then started totally ripping up northern Syria. I'm sure you've all heard about Kobani, where the Kurds are about to lose their last major stronghold in the north. A not-too-dramatized depiction of Kobani's current situation. 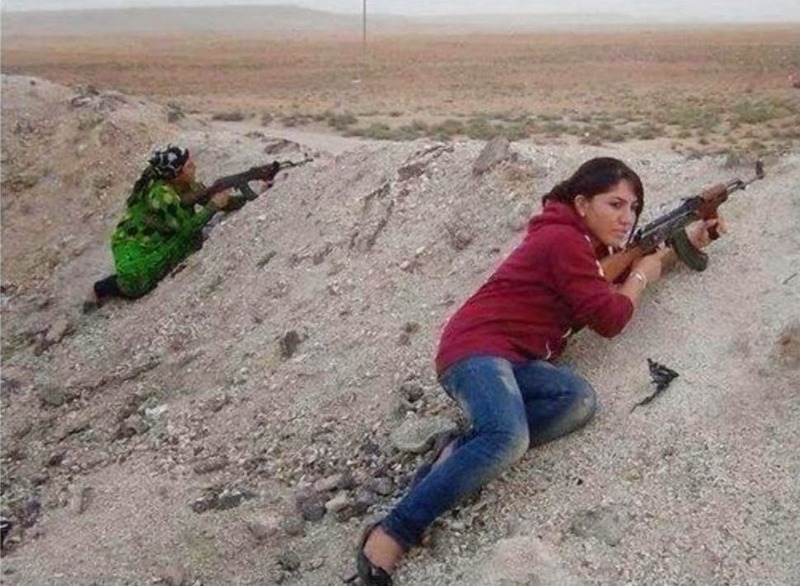 It's gotten bad enough that young(ish) girls are taking up arms against ISIS. The good news about this is that ISIS superstition states that being killed by a woman means no virgins in heaven, so they're actually a little squeamish about fighting women and are apparently not quite as effective. So it looks pretty bad, and certainly the Iraqis and Syrians haven't been able to just clean up this problem like it's no big deal. I had been wondering, "how the heck did I get this so wrong? Where did ISIS' magical power come from?" So I did some digging around, and it turns out I'm not as wrong as I thought. Let's look at things big picture, then piece-by-piece. The Messy Situation in Iraq & Syria. Grey is ISIS, Yellow is Kurd, Purple is Iraqi gov't, Red is Syrian Gov't, Green is Syrian Opposition. Big version here. Much like an American election, looking at the colors in terms of square miles really makes things look pretty lopsided. Let's look first at Iraq. See those little purple strands stretching out like fingers to the northwest? That's the Tirgis and Euphrates. Yeah, that cradle of civilization thing. Where all the people actually live because the rest is desert (see the blue dots? Those are towns). Months ago, ISIS had all that stuff. So in Iraq, most of that grey is... desert. ISIS holding Mosul, Tikrit, and Fallujah is bad news, but it's not existential if the tide is turning. Now it's certainly not all peaches, especially just west of Baghdad. Those who have been wonking about Iraq for the past decade will immediately notice that this is Fallujah, the toughest enclave of anti-Shia/government sentiment and a perennial tough spot (to put it almost hilariously lightly) since 2003. That will be the last nut to crack in the ISIS counter-offensive. Tikrit, which is the town-of-size just north of Baghdad, will probably be much sooner. Baghdad is actually currently working (albeit slowly) on taking a few nearby towns, including Ramadi, Haditha, and Muqdadiyah. Iraq just took Baiji today. Now that Iraq is starting to win some fights, the chances of its troops dropping their guns and fleeing at the first sight of enemy forces has dropped (at the very least, Iraq is starting to figure out which troops are relatively reliable). So it's pretty good news in Iraq... at least by comparison (I don't want to underplay that this whole mess is a little terrifying and also an incredible human tragedy). "But why not more?" I hear you ask! In short, the Iraqis are taking their time and making sure they're darn well prepared for a major assault. The Americans are doing a bunch of training and will likely lead the planning (and of course provide coordinated intel and air support, which will actually be a pretty big deal) in order to make the counter-assault something that's swift... when they get around do it. That's coming in 2015. For now, if you live in Mosul, "sorry." CNN has a pretty long article that, while irritatingly unwilling to take a stand on anything, is quite informative, called "Has ISIS Peaked?" It talks about some of the other gains that Iraq is making, including interrupting supply lines, counter-siegeing, and being able to predict ISIS movements (and then call American airstrikes) that prevent them from being able to quickly take territory anymore. The blitzkreig is definitely done, and wasn't enough to break Iraq's back. So we'll keep an eye on this but get excited for early 2015, when the Iraqi army launches its counter-offensive. We can be optimistic largely because ISIS is not like the Taliban: where the Taliban is largely an insurgent army that controls its territory by having a relatively strong support base and Kabul's capacity to assert itself is weak in its areas, ISIS is a small and hated organization that happens to have gotten its hands on a lot of money and tanks. Where the Taliban can melt away and come back, ISIS will have to hold its ground in its urban controllings and fight a conventional war, as attempting to flee will mean the loss of its hardware (either by leaving it behind or having it bombed) and money. If they come back, they'll no longer have the element of surprise and, hopefully, the Iraqi army will be trained just enough to fire a few shots back before retreating, which should be enough given the army's vastly overwhelming numerical advantage (about 10:1, and the offensive can likely concentrate that further). Unfortunately, Syria's prospects area not nearly so good. In Syria, one literally has 4 groups all fighting each other: the Government, the Opposition, the Kurds, and ISIS. ISIS even recently signed an agreement with al-Qaeda there to stop fighting each other. It's bad news. The Kurds and the Opposition teamed up for a while in Aleppo, but they're now too broken apart to help each other. As much as Assad is a bad guy, the fact that the Government, Opposition, and Kurds are all fighting each other means that ISIS will continually have opportunities to exploit wedges and move into weak points (as these groups move troops to fight each other). If, for example, the Government forces are being pressed at one side, the Opposition won't back off in order to help the Government repel ISIS--they'll take advantage of the weakness themselves and move in. It means that nobody (except maybe the Kurds, who are so cornered that they're out of the Gov/Opp civil war) can fight ISIS without worrying about being stabbed in the back. To deal with Syria, the anti-ISIS "coalition" (really, the US) needs to play a game of containment until Iraq is handled. The Kurds have the best chance at actually seriously fighting ISIS at the moment (they seem to be taking Kobani back), and they're getting help from Iraqi and Turkish Kurds as reinforcements. The Westphalian implications of this multinational joint Kurdish effort will not be lost upon the keen student of political science, but I'll avoid digressing. Once (if I'm right) Iraq is somewhat taken care of, the Iraqi Kurds are likely to form an offensive to help liberate northern Syria. To be fair, they're likely to stop after they liberate all of Kurdish territory, leaving the remnants of ISIS from the Kurd regions and from Iraq to focus what's left of their power on the rest of Syria. US policy will focus on a dubious strategy of trying to arm the rebels and use airstrikes against ISIS to help the Opposition fight both ISIS and the Government at the same time. I don't think it's a fight that the Opposition can win. To achieve both a limit of bloodshed and a swifter, surer end to ISIS, the US may need to give up on the Opposition and make sure Syria is more united. But it won't happen.